H.E. Garchen Rinpoche at the Sakya Monastery, Seattle, January 2013. Photo by Katia Roberts. Drikung Seattle was founded by H.E. Garchen Rinpoche in 2013. ​Drikung Seattle is a Dharma center in the Drikung Kagyu tradition of Tibetan Buddhism. We meet at a private residence in the Wallingford area of Seattle every 4th Sunday of each month. Please contact Yanfen or at 206-420-9278. Please see Weekly Practice for information about our weekly practice gatherings. ​Sign up on the Contact page to be on our email list. Please read the latest updates and additional information regarding H.E. Garchen Rinpoche's Seattle teachings. All the information you need to know about the teachings is contained below, so please read carefully and refer back, if needed. 1. BLESSING OF PRACTICE ITEMS: Each Friday during the empowerment, personal practice items (beads, statues, pendants, etc) will be consecrated. If you have items you would like blessed please put them on the table marked BLESSING ITEMS before the empowerment starts. Please put your item(s) in a plastic bag with your name on it. We will provide plastic bags and labels at the table. 3.TSOK OFFERING: There will be a Tsok (feast) offering to celebrate the culmination of this auspicious event in Seattle on Sunday, April 28 @2:30PM. You can donate for this feast online (under general donations) or at the venue. The donations will be used to purchase food and drink items for the feast. 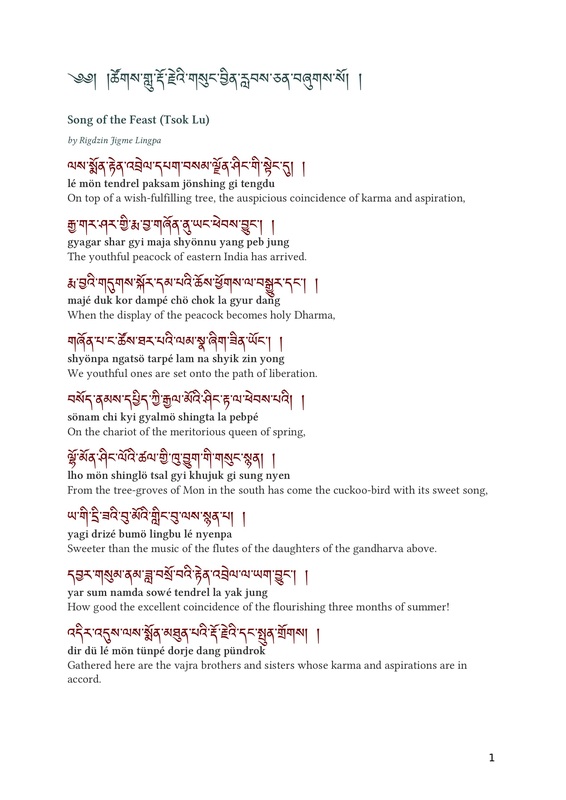 We will be singing a traditional Tibetan Dakini Song. 4. MANDALA OFFERING: You will have the opportunity to make a mandala offering to Rinpoche on Friday, April 26. If you would like to participate, please bring a katak (white offering scarf) and a donation (for Rinpoche). There will be a sign up sheet at the venue marked MANDALA OFFERING. 5. PRAYERS FOR LIVING & DECEASED: On Sunday, April 28 from 9:00-12:00, Rinpoche will perform a ritual and make prayers for the living and deceased. If you have specific persons who need Rinpoche's prayers and blessings, you will have the opportunity to write one or more names on an individual card and all cards will be presented to Rinpoche for blessings. There will be a $5 donation towards this ritual. All cards will be burnt at the end of the ritual. 6. WALK-IN REGISTRATION: Walk-in registration will be open from 8:00AM-8:50AM and 1:00-1:50PM each day. So if you are planning to register at the door, make sure you do so during these times. Follow this link https://northseattle.edu/mapto the NSCC map. The venue is in the College Center Bldg. 7. SIMULTANEOUS TRANSLATIONS OF TEACHINGS: There will be a simultaneous translation of the teachings into Chinese and Vietnamese. We have 40 new FM headsets for translation of Chinese and Vietnamese or you can bring your earbuds and install a radio app on your phone. Then click on tickets and scroll down to the bottom. You will find a GENERAL DONATION button. 9. 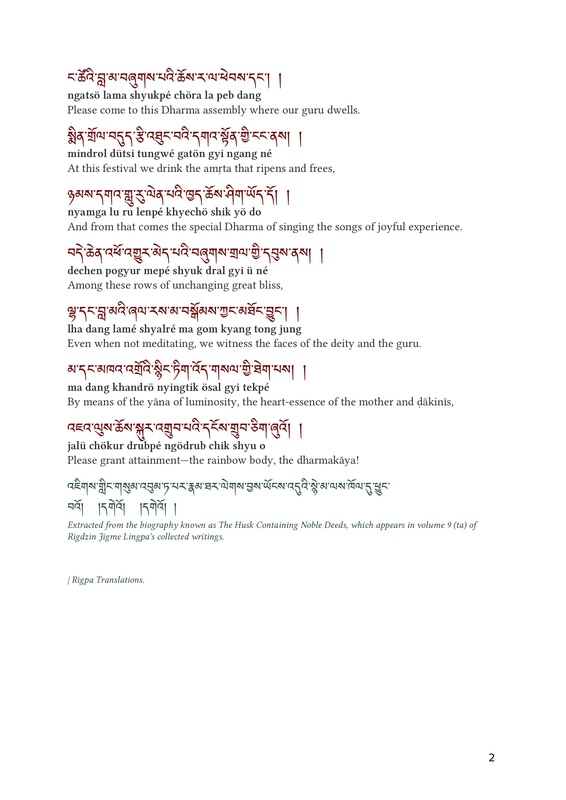 PRAYER BOOKS, SADHANAS, AND LITURGY FOR CHOD: We will have Prayer books, 37 Bodhisattva Practices, 7 Taras Sadhana, Kuntuzangpo Prayer available for you to use during the teachings. You can pick those up at the Information Table. For those who will receive Chod empowerment and want to practice Chod, the sadhana will be emailed to them. To receive the sadhana, there will be a CHOD SADHANA sign up sheet at the Information Table. 10. There are 6 spots available for Wed April 24 from 10AM-11AM. Please sign your name on the sign-up sheet at the venue for whichever day works best for you. We will use a lottery system and pick 6 people for each day from each list. Those who do not get the individual interview, they will be able to join a group interview on Wed., April 24 in the afternoon. 10. RIDE-SHARING: There will be a sign up sheet (name & phone number) at the Information Table for those who want to share a ride to and from the venue and/or to SeaTac. You will have to make your own arrangement with the ride share commuters. -A single bunk bed in a 6-person female or male dormitory at the International Youth Hostel in Seattle, which would be $31 US per night. You can check their website and availability at https://www.americanhotelseattle.comIt is about 15 minutes by freeway to the North Seattle Community College where Rinpoche will be teaching. -You can also check https://www.airbnb.com/s/Seattle--WA or https://www.vrbo.com ($40-50US per night) in the neighborhoods of Northwest Seattle, Northgate, or Greenwood which are close to the NSCC. https://www.eventbrite.com/e/garchen-rinpoche-seattle-teachings-2019-tickets-53160712121 Then click on tickets and scroll down to the bottom. You will find Student/Scholarship, donate what you can. Please print your receipt. Purchasing the ticket in this category will also register you for the teachings. Appeal to help a struggling family from Gargong, China (Tibet)!Recently our spiritual director, Abao Lama asked the Drikung Seattle members to post a story of the Tsering family from Gargong, Yushu, China (Tibet) which is the seat of the monastery and the hometown of H.E. Garchen Rinpoche and the lamas who now reside at Garchen Buddhist Institute in Arizona. Father Tadrub and mother Konchog who have three children Konchog Tsering, Pulbu Tsering, and Trinley Tsering (all pictured in the photo) have been born and lived all their lives in Gargong. The family is very poor even by the Chinese standard. They don’t own a Yak to make a profit from it. They traveled quite a distance to the town of Nangqen but were unsuccessful finding a job there. The family has repeatedly asked Aboa Lama for financial help to survive. Please consider helping the Tsering family! By supporting them, you are supporting the Gargong community of Garchen Rinpoche and the Gargon Lamas. Since sponsoring a family is not tax deductible, your donations will have to be made by a check to Yanfen Wang; c/o Drikung Seattle P.O. Box 31711; Seattle, WA 98103 and she will have to change the money to Chinese Yuen to wire transfer it to the family directly. Thank you for supporting this cause and improving the lives of Tibetan people. Please note that the new site www.drikungseattle.com is not associated with our center or activities. Drikung Seattle is a 501(c)(3) nonprofit religious organization.